The storage tanks for all Solar Edwards roof-mounted solar hot water heaters are stainless steel and do not have any moving parts. They are therefore very durable and require minimal maintenance. Solar Edwards solar hot water roof-mounted systems come in 3 sizes – 180 litres, 305 litres and 440 litres. We can advise you on which is best for your home and situation. Live in a Frost Area? Solar Edwards has a solar hot water system designed specifically for frost areas. The Solar Edwards LX series uses the highly efficient heat transferring properties of a special anti-freeze fluid to transfer the absorbed energy to heat the water indirectly. With an ‘indirect system’ water does not pass through the collector panels, instead the anti-freeze mixture is circulated from the collectors through a stainless steel heat exchanger, transferring the heat into the water. The benefit of this ‘indirect system’ is that it can be confidently used in frost areas, without risking damage to the system. It offers protection against freeze damage in conditions of up to minus eight degrees Celsius. Don’t want or can’t have a roof-mounted solar hot water system? A Solar Edwards ground mount solar hot water system is the answer. If you don’t want a roof-mounted solar hot water system or your home is not suitable then the Solar Edwards ground mounted solar hot water system (available in both 325 litres and 430 litres) is the system for you. The advantages of the Solar Edwards ground mounted solar hot water systems are two fold. Firstly; the different family sized storage tanks provide flexibility of installation options. Secondly; the stylish, slim-line design of the collectors minimises the visual impact to your home. Home not suitable for Solar? A Solar Edwards Heat Pump system is the answer. If the roof of your home is not suitable for solar, or your roof is extensively shaded then the Solar Edwards Heat Pump is the system for you. This innovative system operates like a refrigerator only in reverse; transferring heat from the surrounding air to the stored water. The Solar Edwards Heat Pump’s use of refrigeration technology makes it extremely efficient using one third the energy of a conventional electric hot water heater. 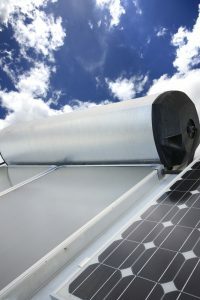 As a result it qualifies for similar environmental incentives as traditional solar hot water systems.